Leading legal practice management software creates an amazing and inspiring experience for legal professionals. We have always prided ourselves on providing an exceptional product and customer service experience. Now we’ve taken that to a whole new level. Rocket Matter, the pioneering cloud-based law practice management software, today announces the launch of Atlas, a complete redesign of their flagship product’s user interface that also features powerful new workflow tools. The redesigned interface gives lawyers a bold, powerful experience with brighter colors, improved typography, and a cleaner, more intuitive layout. The design takes advantage of today’s new retina displays, leveraging their full-width and visual capabilities, offering users a beautiful environment for conducting law firm business. "We wanted to design something stunning that doesn’t just turn heads but also makes using Rocket Matter even more enjoyable and productive" says Larry Port, Rocket Matter’s CEO and founder. “Atlas does just that—our clients really enjoy working in it, which helps them feel that they’re on top of their game." Atlas reaches beyond the parameters of design alone. It provides streamlined workflows and simplifies adding matters, billable time, documents, tasks, and other features from every screen in Rocket Matter. Navigation boasts easy-to-use, elegant iconography that is located on the left side of the screen. Users can expand or collapse it as needed. The Rocket Matter revitalized calendar is much more user-friendly and includes a new agenda view and differentiated user colors in the monthly view. Busy professionals will find this feature faster and easier to use. Another exciting time-saving workflow is our new robust Matter Templates functionality. Matter Templates allow attorneys to set up and automate the process for handling different specific matter types by specifying a group of tasks, calendar events, and custom data fields. Once a template is setup, it can be used repeatedly. Attorneys who routinely work on cases based on pre-determined deadlines, tasks and events will save time immediately. Clients can easily create templates for various practice areas, like family law, criminal defense or immigration law and associated events and tasks will populate automatically. 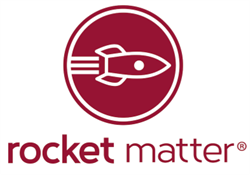 Rocket Matter, LLC (URL: http://www.rocketmatter.com) helps law firms grow profits and serve clients through legal software, exceptional customer service, and educational content. The company’s flagship product, Rocket Matter®, is the leading legal practice management and time and billing platform in the cloud. The system helps law firms organize their matters and increase their billing efficiency. Rocket Matter Intake automates new client relationships. Launched in February 2008, Rocket Matter’s corporate headquarters is in Boca Raton, FL.